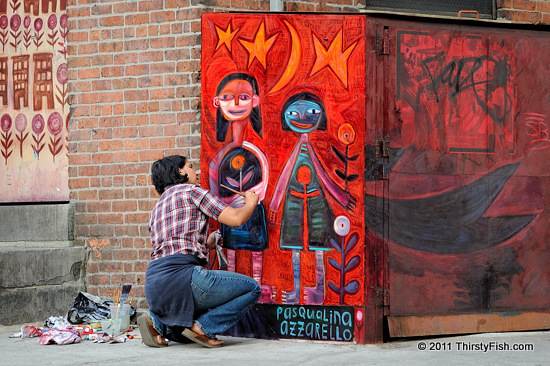 While strolling around DUMBO, I noticed this Artist at Work. I watched her concentrate on her creation for about five minute and then took this quick snapshot. "The only way to deal with an unfree world is to become so absolutely free that your very existence is an act of rebellion", is a quote from Nobel Literature Prize laureate and philosopher Albert Camus, whom I had introduced in a previous post. Consistent with the idea in yesterday's post, one of the greatest challenges an artist faces is conformity; An artist often starts with vision and dreams that are more advanced, more sophisticated than the society that he or she is in. If eventually society catches up, the Artist gains recognition. After some time, as fashions shift, or when there is regression in society, the reputation of the artist falters. Albert Camus dealt with this idea in his short story "The Artist at Work" as an allegory to his own experience. Being an artist is tough. On one hand, "creative freedom" implies eradication of conformity; On the other hand, the artist has to find ways to communicate his or her message to society. If the message is oversimplified, the artist risks being ridiculed in the future. And, if the message is too complex, the artist fails to communicate it. And of course shifting fashions do not help. Most artists, philosophers, writers, poets and even scientists have had to deal with this dichotomy.